Dimensions (H x W x D) 34" x 27.63" x 30.13"
With 2 drawers, the 28" ADA Compliant Undercounter Refrigerator w/ Drawers (TUC-27D-2-ADA) is a small unit to maximize space in the kitchen and ensure that you have everything you need on hand at any given time. High quality metals and internal components work together to give you lower operating costs and a machine that performs better at colder, more consistent temperatures. 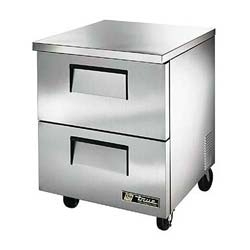 The unit is made from stainless steel for a piece of equipment that will not rust, corrode or tarnish even over years in a professional food service kitchen. Ecomate, an innovating material used throughout the unit, brings you high density insulation for an earth-friendly and durable refrigerator. Acquire refrigerating space without sacrificing available floor space with this useful undercounter product.